The other day I got a chance to speak to Stephanie Vicente of Herd magazine a fun little independent Ottawa based magazine. Since this month is support local month I thought it would be a perfect time to showcase them for Magazine Crush. 1. Tell us a little bit about yourself & your team? I'm 29, born in Calgary raised in Ottawa. I have always been a writer. Ever since I was a little girl I've been writing all the time. I also have a professional background in film and television production, but left the field to start Herd Magazine. It might seem like an odd jump, from film and tv to editorial entrepreneurship, but it felt completely natural to me. We have a creative and design team, Isaac Vallentin and Pascaul Huot, and together they make LOG-CB (click here for their website). I believe them to be the most progressive and creative dudes in the city. We've also got an Associate Editor, Patrick Jodoin, who is my right-hand man. Our Photography Editor is Chris Snow who possesses a Bachelor of Fine Arts in Photography from Concordia University. The magazine also wouldn't be possible without our amazing contributors, some have been with us since the first issue, and others have joined us later in the game. 2. What inspired you start Herd? Unhappiness. For so long I thought I was made to work in film. I wanted to direct. I wanted to be Quentin Tarantino's female counterpart. But the longer I worked in the industry the more I missed working with words. I had some pretty dark times over the years, and writing was always my form of expressive therapy. When I didn't have time to do that anymore (because I was working 14-20 hour days on set) I forgot how to get in touch with myself. I saw where the darkness was leading me and I knew I had to change my lifestyle. This happened at a time when I was falling in love with Ottawa and the underground culture. I had previously worked on a culture magazine in Whistler, BC and remembered how neat it was to interview artists and learn some intimate stories about them. I wanted to do that for our Ottawa. 3. How do you source your material? There's not much rhyme or reason to it. Sometimes I catch wind of something that I think would make an interesting story and I write the idea down and assign someone to it for the next issue. Other times writers come to me with their own pitches. It's all very organic. 4. Whats your favourite thing to do outside of work? That's a tough question because I'm not obsessed with any one thing outside of writing. I absolutely love films, especially French new wave films. I love to read. I love to ski. I love to drink bourbon. I love fashion. I love thrift shopping. I love live music. Basically, I like to do all the stuff that someone would expect me to like, haha. 5. What magazines are you currently in love with? Kinfolk is so great. I love the quality of the photography and the writing. I absolutely love the colour palette. I also like Inventory even though it's more geared towards men. And Monocle Magazine for its diverse coverage and outstanding curation. 6. What’s next for Herd? We've recently recruited several online bloggers to keep up with some online content. We're aiming for the site to help us reach a larger audience, perhaps beyond Ottawa. We're also playing with the idea of larger, special-limited-edition issues for sale nationwide. Right now though, we're upping our distribution numbers to accommodate the growing demand. This last issue was the quickest issue we've moved. If we're going to make sure that as many people are picking up hard copies of the magazine as possible then we're going to have to print more copies! When ever I'm having a lazy day or feeling overwhelmed by my todo list I think of Janine Vangool. She is the founding editor, researcher, designer of Uppercase Magazine, social media master, small business owner. With all that on her plate Janine is also a wife and mother to little Finley. The amount of this Janine gets done in one day is truly inspiring. The other day I got the chance to pick Janine's brain and here's what she had to say. I live in Calgary, Canada with my novelist husband and four year old son. I worked as a freelance graphic designer in the arts, culture and publishing sectors and have also taught typography and publication design at the college level. UPPERCASE started as a store and gallery in 2005 where I highlighted design and illustration while freelancing from the same space. 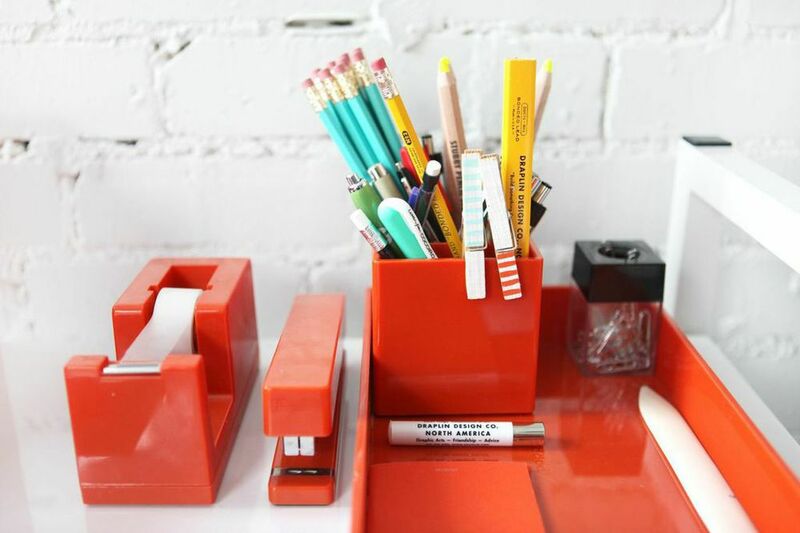 What inspired you start Uppercase magazine? As a designer, I longed for the challenge of creating content rather than just making clients’ work look good. UPPERCASE was launched in 2009. It is directed to creatives — designers, illustrators, typographers, crafters and bloggers — who have a wide range of interests; a broadly inspiring magazine wasn’t available at the time. It was the magazine that I wanted to read. Is there anything that came as a surprise to you when you first started Uppercase? It has all been surprising: how much work it is, how well-received it has been by my subscribers... and how much I love doing it! Is there a story behind the name? What inspired it? When I started my gallery/store, it was on the upper level of a 3-level arts complex. I wanted a name that referenced typography, so UPPERCASE was a natural fit. Later, when it morphed into a magazine, I kept the same name since I already had a few years of investment and recognition into the name. Whats your favourite thing about running an indie magazine? My favourite part is being so connected with my readers. I can email and chat and instagram with them all day long (and I do!) and discover what they are interested in. I can be pretty flexible in the kinds of content I run because I know my readers and don't have to go through some sort of editorial hierarchy. What are your sources of creative inspiration? How do you come up with new ideas for the magazine? Inspiration is everywhere! I’m always looking at blogs, books and other media. I also receive lots of content suggestions and portfolio links from our readers and more and more often the inspiration is coming directly from our subscribers. They’re a talented and enthusiastic bunch! I often notice trends or themes from what I’m seeing and collecting and those eventually emerge as themes to explore in future issues. What magazines are you currently in love with? Hmmm. I'm always looking at and collecting magazines. But now that I've been running a magazine for nearly 6 years, I don't think I can be "in love" with any other magazine but my own. It is hard to just kick back and relax with a magazine now, since I'm always experiencing it from a different viewpoint that a typical reader. There's always an element of "work" aspect in each magazine that I read. 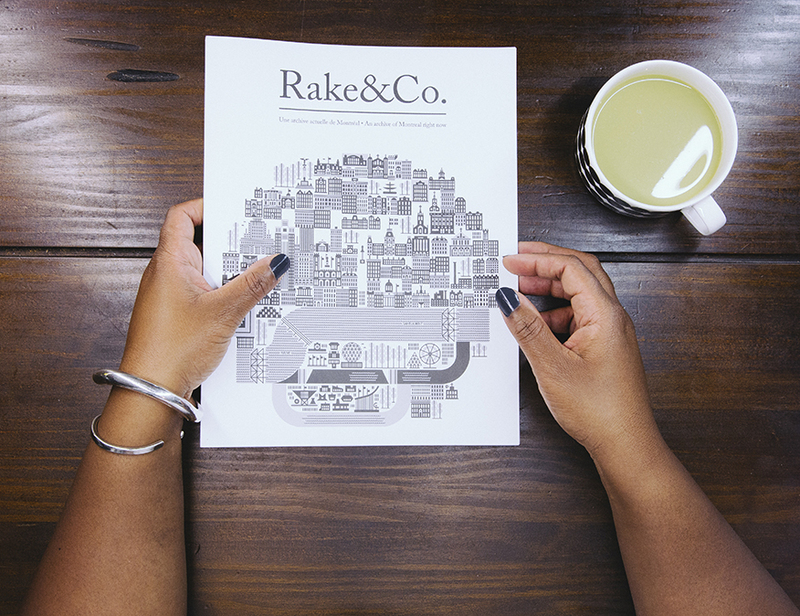 What advice would you give to someone who’s thinking about starting their own magazine? The "how do I launch a magazine" is a question that I get a lot and my advice is to do your research: understand your audience, get your print or other production costs figured out and know your tolerance for risk. I'm considering creating an e-book or e-course on the topic if there's enough interest. Where do you see the magazine five years from now? I'll have made 20 more issue by then! Wow. That's almost double what I've done so far (23 issues). My goal is to make the day-to-day running of the magazine easier, so that I can concentrate on what I love best, which is content and design. I will continue to grow the magazine and its readership, slow and steady. I hope to offer more publications and products and even some small-scale conferences or events. I'm a freelance graphic designer and now a new mum. I publish Extra Curricular, a magazine about getting creative with your spare time – I started it five years ago and it has evolved a lot since then. I am lucky to work with a growing and ever-changing little network of talented writers, photographers and illustrators who put so much passion and hard work into what they do. My right-hand lady is Sonya Nagels – a fantastic photographer who also writes, edits, illustrates and gives pep-talks like a champ. We are all curious (nosy) about the processes and spaces of creative people, and Extra Curricular incorporates a love of design, illustration, photography, print and paper – all rolled into a compact A5(ish) package that feels nice in your hands. Judging that your friend gave you a tea set when you were 30 I’m assuming you're an avid tea drinker like myself. I'm a spice-lover, so it's chai, all the way. Preferably the proper milky version. I down an awful lot of peppermint as well. To be honest though, a good strong long black wins for me! What led you to start a magazine? Like every design student, ever, I had always dreamed of publishing a magazine. I am a notorious procrastinator, but the year I turned 30 I realized if I didn't just make myself do it it would never happen. In the end it was a natural way to bring together all the creative types I knew and admired, and to get more involved in the creative community. I am a serial hobbyist, and I love having creative side-projects on the go – ceramics, jewellery, sewing and screen printing have been among them – so that's where the concept for Extra Curricular came from. It was scary – I had no idea if anyone would like it and I had to sink a chunk of cash on the initial print run of 500. I wanted to put it out there and then hide under a rock, but you can't really hide under a rock if you are trying to sell something! It is still nerve-wracking every time an issue goes to print. What stock do you use? It is all FSC certified stock - Advocate Linen for the cover and Sumo Laser for the rest. How do you choose your content? I am constantly gathering ideas for possible content. Each issue has a theme and the content slowly comes together around that – I skulk around the internet, meet people at markets or through friends, contributors pitch content and readers email me too. It's a mix of stumbling on cool things I want to feature and seeking out content that fits the theme. There is so much out there I think it's important to be true to the things that really fit what you're trying to achieve. It is hard to say no to people, but if Extra Curricular isn't the right place for them there will definitely be somewhere that is. What magazines are you currently addicted to? So many! Apartamento is my ultimate magazine store indulgence (luscious Spanish mag featuring real, lived-in homes and their eccentric residents). I also love Uppercase (Canadian mag full of design, illustration & typography), Wrap (illustration mag which includes pull-out sheets of wrapping paper), and Offscreen (a behind-the-scenes look at the people behind web-based businesses, but you don't need to be into web developing to read it!) All independent publications that have really taken off without having a big publishing house behind them. What advice would you give to someone who’s wants to start their own magazine? Have a point of difference – there is a steady stream of new mags out there. Talk to retailers once you have a solid concept and at least some of the content, but before you go to print. Get their advice on pricing and try to pin down some pre-orders. Get several print quotes and go in and talk to the printers. They can give advice on paper stocks, quantities needed to make an offset run worthwhile, and sizes and numbers of pages to avoid paper wastage – they may even be able to give you a print discount in exchange for an ad. Above all, do it for love, not money! I'm an avid indie magazine reader and collector, as you can see from some of my previous posts about magazines here & here. Because of my love for unique magazines, I usually scour the internet to see what's new. I often ask my local magazine store if they can bring in certain magazines and now they jokingly call me the high-end magazine lady. For the most part they are usually pretty receptive and have brought in magazines as per my request. During conversations with the store manager, I found out about the "list"– that they don't really choose what magazine to carry, the distributor does. In this day and age, with access to the internet, you can see how many high quality, independent magazines are out there. Unfortunately, most of them aren't available to people who would actually enjoy reading them because they are not on someones "list". I thought I would do my part by sharing my discoveries with you. My new "Magazine Crush" posts will consist of two segments; one about the magazine itself & the other about the people behind the magazine. Today's magazine crush is about Extra Curricular. I discovered this magazine on Instagram and something about it really connected with me. I immediately got in touch with the editor Ellie Smith and a few weeks later here we are. It came to me all the way from New Zealand in a cute, little envelope filled with stamps and the sweetest post card tucked inside of it. 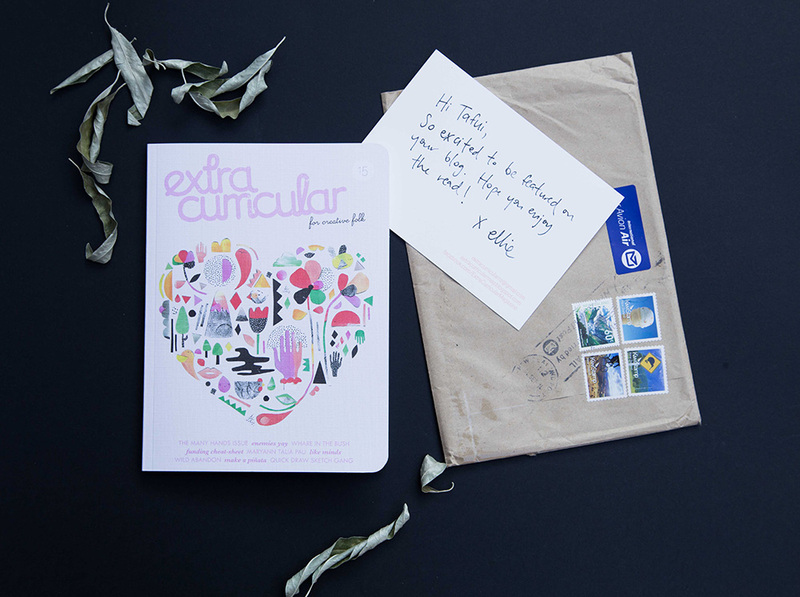 Extra Curricular is 75 pages of wonderful, inspiring stories about everyday creative people doing extraordinary things with their lives. The thing that really got me is that the magazine is printed in a limited run of 1000 copies & every single copy is hand numbered. Such a personal touch, it's like receiving a little package of love in the mail. "Extra Curricular is about folks who get creative with their spare time. Published out of Auckland three times a year by Ellie Smith and a small team of dedicated contributors passionate about making and doing, Extra Curricular features up-and-coming creatives from both sides of the Tasman who care about the world and what they are putting out into it. High production values and beautiful paper stock – combined with a curiosity about the processes and spaces of creative people – make for a compact package that feels nice in your hands. Created in 2009, and now a few thousand copies down the track, each one is still hand-numbered – we like it that way." Follow ≪: Tafui |'s board MAGAZINE CRUSH on Pinterest. The new Mjolk book is out! In this issue they explore the world of the Japanese Tea Ceremony with an exploration of Japanese Potter and Tea Master Masanobu Ando's Chabako Tea box with tea tools. Interviews and workshop tours of Ryuji Mitani, considered to be the most famous wood artisan in Japan, Kyoto based wood artisan Shingo Tsukuda who blends modern forms with traditional technique making furniture and objects for the Tea Ceremony, and Quebec based potter Renaud Sauve of Atelier Des Cent-ans. They also visited three major works by iconic architect Terunobu Fujimori and talk to him about the Tea House as an architectural form. Finally they featured their visit with Minoru Oya from Kafe Kosen in Kyoto to take a critical look into his interpretation of the "Coffee Ceremony". I discovered the cutest new magazine while I was visiting one of my favourite flower shops. Most of you know I have a thing for magazines, so while I was waiting at the cash I had to take a peek. I was pleasantly surprised that it's 100% Ottawa! Caviart is the brain child of graphic designer Nicole Vallée & photographer André Rozon. The magazine is loaded with beautiful photography and unique finds. Q. What’s your opinion on "print is dead"? A. I don't think "print is dead". I do think print has evolved. I think we're more thoughtful and less wasteful about print — the subject matter is more specific and the target audience is more defined. Websites are evolving to look more like print magazines and magazines are learning to be more nimble in terms of production and reach. Digital and print can co-exist. At the end of the day it's about delivering information in a way people want to read it. Q. What’s your reason for making a print magazine? A. We felt a print magazine would engage more of the reader's senses. The design and texture of a printed piece are an invitation to be touched, flicked, handled. You can smell the ink on the paper. Digital can never replace that tactile experience. We hope the magazine will become a coffee-table book — have a longer shelf life than an online publication. Between you and and me, after spending a typical workday in front of my computer screen, I relish the opportunity to read a printed magazine or book and curl up in bed or settle in a deck chair by the river at my cottage. It's a different experience. Laptops and iPads just aren't as romantic or comforting. Q. What stock did you print your magazine on? A. The paper is Cougar Smooth. It is an FSC certified stock. It has a wonderful finish that brings a soft and milky effect to the photography — again this effect could only be achieved through print. Q. How often will you be publishing an issue? A. We plan on publishing once a year, for now. You can purchase a copy of the the magazine here and they also have prints like the one above for sale too. You can check out my magazine crush here. A few weeks ago I was browsing through Viens Avec Moi ( a boutique in Ottawa's west end) when I came across Rake & Co Magazine. I was immediately attracted to the beautiful Raymond Biesinger illustration on the cover and after going through the first few pages I was hooked! I really loooooove the concept! It's 120 pages of pure Montreal goodness. I'm pretty excited to go visit some of the great spots & shops that they featured. Lets just say it doesn't take a lot of convincing for me to go visit MTL. You can grab a copy here!